On October 22 of 1926, The legendary performer, whose real name was Ehrich Weiss, had a show scheduled at the Princess Theater in Montreal. Later, in his dressing room, a McGill University student, J. Gordon Whitehead (whatever happened to him? 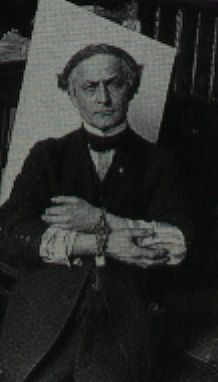 ), who was reputed to be a school boxing star, asked Houdini if it were true that he could take any punch to the abdomen. Houdini was sitting on the couch half-listening, and mumbled a yes. As he stood up, Whitehead hammered 3 punches into his belly before Houdini was able to prepare for the blow. That evening and the next he continued his performances with much discomfort. He then endured a 1000-mile train ride for a 2-week engagement in Detroit, to perform at the Garrick Theater. 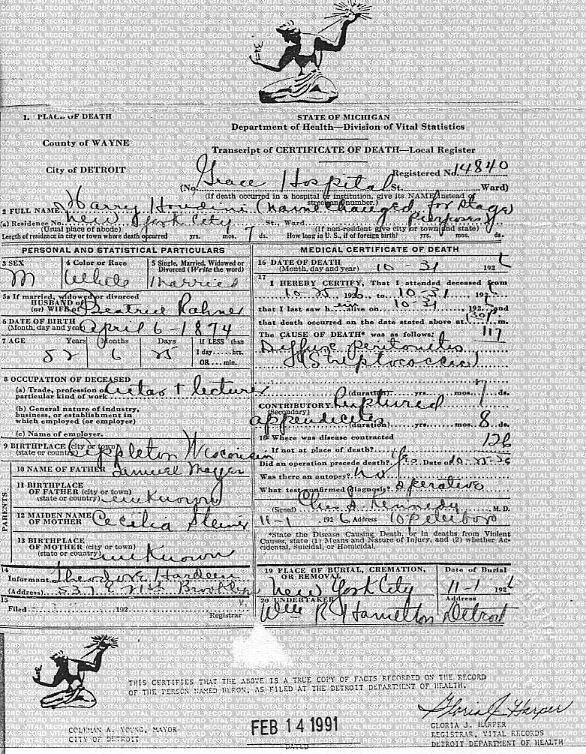 On Sunday, October 31st, Halloween day, at 1:26 p.m., Houdini died in room 401, Corridor D, in the old John R. Wing of Grace Hospital (See it then and now). 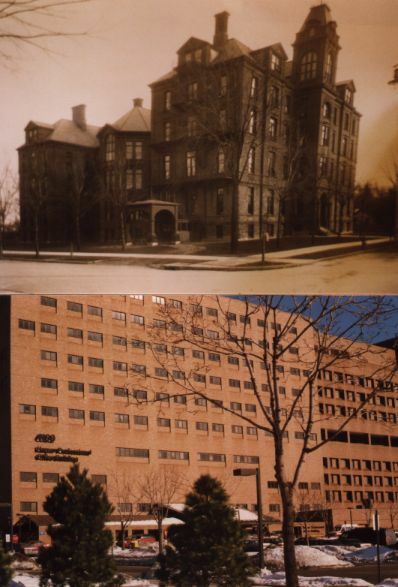 Apparently, according to FAD friend Karen Hunt, Grace Hospital was quite historic, built, I think, during the Civil War, was torn down in the 1970s. 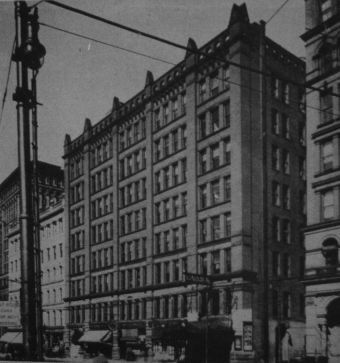 The “now” photo of the building is a completely different building than the one in which Houdini died. His body was taken to the funeral home of W.R. Hamilton and Co., 3975 Cass Avenue. No one had been permitted to view the body. He lay in a great cumbersome coffin that he had built just 4 weeks earlier, specifically to use in his stage presentation. It was for a trick. It was a dull bronze with a full-length glass top. It had been lined with silk, during the last day in Detroit. By a coincidence, the coffin, which he specified in his will should be used for his burial, was left in Detroit when the large amount of paraphernalia used in the show was shipped to New York. Through an oversight, the coffin was left in a warehouse of the Detroit Transfer Company, and not discovered until some time after the other articles had been shipped. A special Pullman car had been added to a train called the “Detroiter”, to take him from Michigan Central Station Monday night. A truck rumbled toward the baggage coach on which was a long box. Mrs. Houdini arrived in a wheelchair, in shock since her husband’s death. The private car carrying the Houdini party in addition to Mrs. Houdini included the magicians two brothers, Theodore Hardeen and Nathan J. Weiss, Miss Julia Sawyer, a niece, Miss Julia Karchere, a cousin of Mrs. Houdini, H. Elliot Stuckel, Houdini’s manager, James Collins, a confidential, technical director and a nurse. He was buried in Machpalah Cemetery, just inside the front gate, next to his mother who had died in 1913. Trivia from Beth: His entire immediate family is buried at the Machpelah Cemetery in Queens, New York- except for his wife Bess. Why? Machpalah is a Jewish cemetery and Bess was Catholic. Bess is buried at the Gate of Heaven Cemetery in Hawthorne, New York. He promised his wife if there were any ways possible to communicate with her from the dead, he would. For years she held séances trying to reach his spirit. 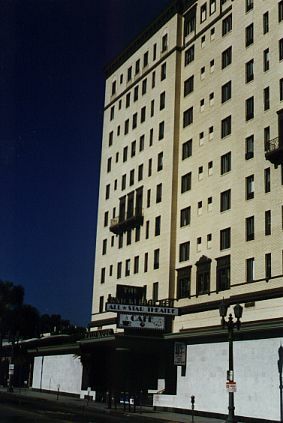 The last séance was at the top of the Knickerbocker hotel in Hollywood, on the 10th anniversary of his death. It failed. Contrary to legend, Mrs. Houdini did not jump from the roof. She died aboard a train, taking her to New York, from Needles, California, on Feb 11, 1943. She was 67 years old. On the 50th anniversary of his death, a séance was held in the very room where he died, again with no avail. On April 10, 1975 vandals smashed the marble bust atop his grave and it lay in disrepair until it was repaired thanks to a donation for $10,000 from his fan, David Copperfield. 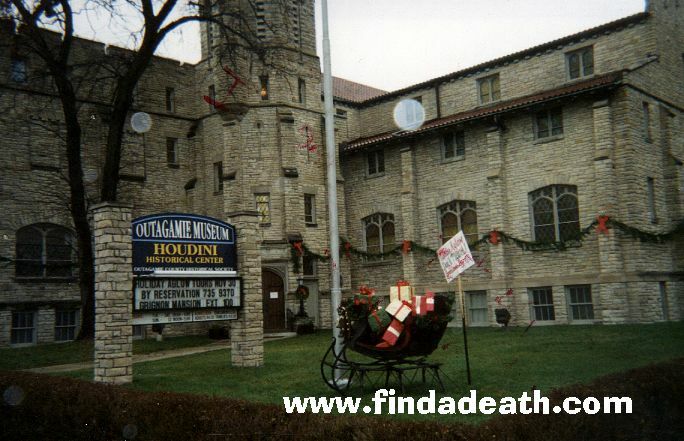 December 13, 2001, my friend Mark Cramer sends this picture of the Houdini Museum in Appleton, Wisconsin. It houses an impressive exhibit on the late entertainer (actually born in Hungary, but his adopted hometown of Appleton was incorporated into his biography to make him seem “American”. He was raised in Appleton for several years. The museum is called the Outagamie Museum, because Appleton is in Outagamie County. Thanks Mark! 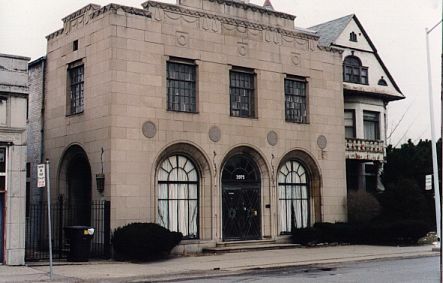 January 2, 2002 – another Findadeath.com friend sends this in: The picture you have of the Houdini museum, has, as I am sure you noticed, two distinct spots. According to people into the supernatural, it suggests something is hanging around. I believe the spots are called orbs and are produced by spirits. Maybe it was just something on the film or the flash, but still worth noting. 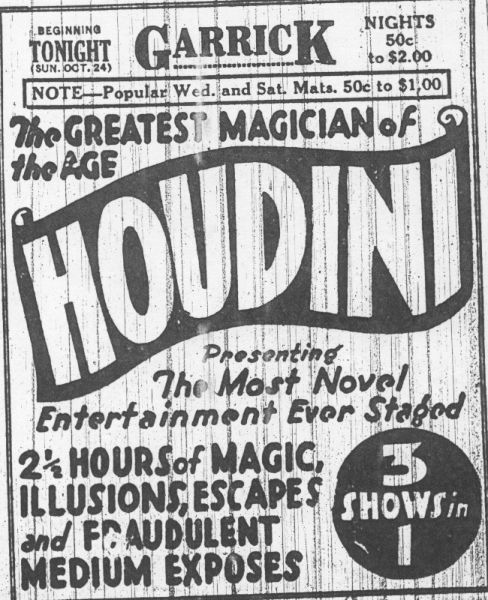 To learn more about the legend of Houdini’s death, go here.